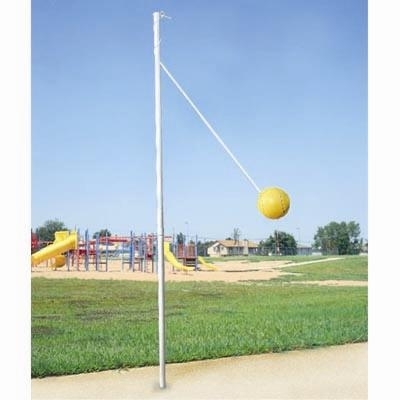 I remember there was a Tetherball pole at my elementary school, Van Slyke, in Flint, Michigan and I would play it when the older kids where not hogging playing it. All I really remember of the game is having two or more people hit the ball on the string as hard and fast as you could and have it spin around the pole. And if you “accidently” hit someone with the ball — you got bonus points!! I don’ think those times that I played Tetherball, I knew that there were actullay rules on how to play it. I thought it was fun to hit the ball and watch it spin on the pole. I wonder if they still have Tetherball on school playgrounds any more? Tetherball is a North American game for two opposing players. The equipment consists of a stationary metal pole, from which is hung a ball from a rope, or tether. The two players stand on opposite sides of the pole. Each player tries to hit the ball one way; one clockwise, and one counterclockwise. The game ends when one player manages to wind the ball all the way around the pole so that it is stopped by the rope. It must not bounce. It’s funny what pops in my head when I’m suppose to be “working”!! Sylvia, I went to Van Slyke in the 60s and I definitely remember that tetherball pole. I have wonderful memories of going to school there. A few years ago in a fit of nostalgia I went back to the school building one afternoon and plucked some leaves and acorns from the huge old oak tree where we used to play at recess. I still have them. Hurt like H E DOUBLE TOOTH PICKS!